The Levator Scapulae – what a pain in the neck! The Levator Scapulae starts out as four little muscles attached to the sides of the first four vertebrae in your neck, deep to the trapezius muscle. The fibers twist around themselves and ascend either side of the neck. 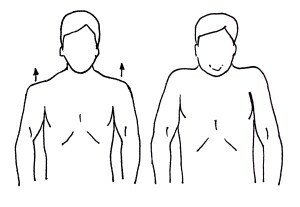 They then join together into one muscle and appear from under the trapezius. The Levator Scapulae attaches to the top of your shoulder blade. When do you use your Levator Scapulae? The Levator Scapulae works in conjunction with other muscles of the back to help you raise or shrug our shoulders, look up to the sky or turn our head to one side. When swimming, the Levator Scapulae is engaged when we turn our head for side-breathing, and when reaching for a glide. When running, the Levator Scapulae works when the arm retracts. Cyclists may shorten their Levator Scapulae if the shoulders are shrugged reaching for the handle bars. In athletes and others involved with physical activities, the most likely cause of Levator Scapulae tension is overuse. Failure to warm up correctly before activity or to stretch and strengthen the neck muscles regularly is a common contributing factor. Another is to train for extensive periods when the muscles have become noticeably weakened. Greatly increasing your exercise program very quickly does not allow the muscles sufficient time to adjust and may also cause tension. Other contribution factors could be maintaining bad posture at a computer, compensation due to an injury, or any repetitive motion. Often, overuse tension in the Levator Scapulae muscle can occur from the muscle working to stabilize the head – therefore working to not move! Pain can be described as a throbbing, ache, or tightness, and is usually presented above the shoulder blade up to the neck. Stretching and strengthening the upper back, neck and chest muscles helps relieve pain and tension, and prevent it from returning. When stretching, it is important tobreathe fully, deeply and slowly. As you feel the muscle relax you will notice your head moves more fully into the stretch position. - Start in a neutral position, chin elevated and shoulders dropped. Increase the stretch by placing your left arm behind your back and toward your right hip. To increase the stretch, bring your right arm up and over your head. Grasp the left side of your head and gently pull it toward your right shoulder. 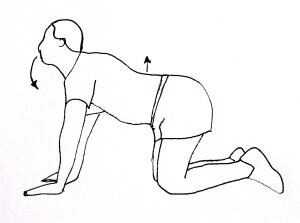 The strengthening occurs during extension, when the head is elevated. Increase the stretch by pulling your shoulder blades together when looking up. - Hold for a few seconds, then drop the shoulders to starting position. Repeat. The strengthening occurs during elevation, when the shoulders are shrugged. Increase the exercise by adding a weight for increased traction. - Slowly and gently roll head in a clockwise circle three times. The strengthening occurs during rotation, when the head rolls from front to back.